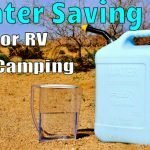 For a little while now I’ve noticed water dripping from the RV water heater’s outside access panel. Not completely abnormal since the units pressure relief valve does this on occasion. But, recently the flow increased from the odd drips to a constant dribble. I knew something must be up. After some investigation, I pinpointed the problem to a leak in the burner chamber. 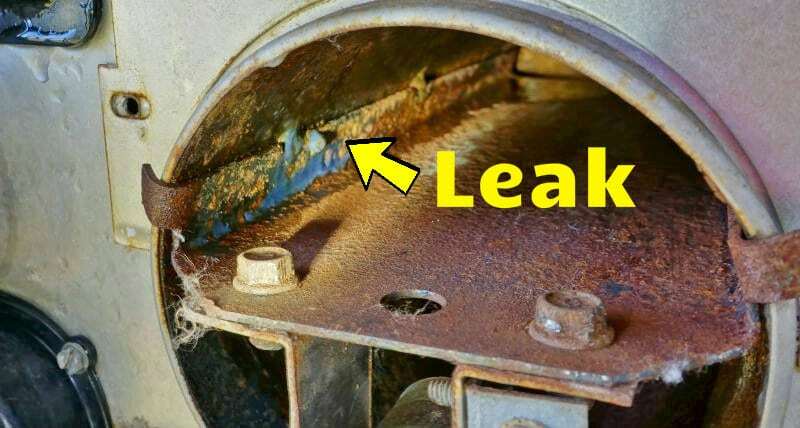 Water was seeping through one of six spot welds used to hold a metal baffle plate in place. The tank was obviously perforated. 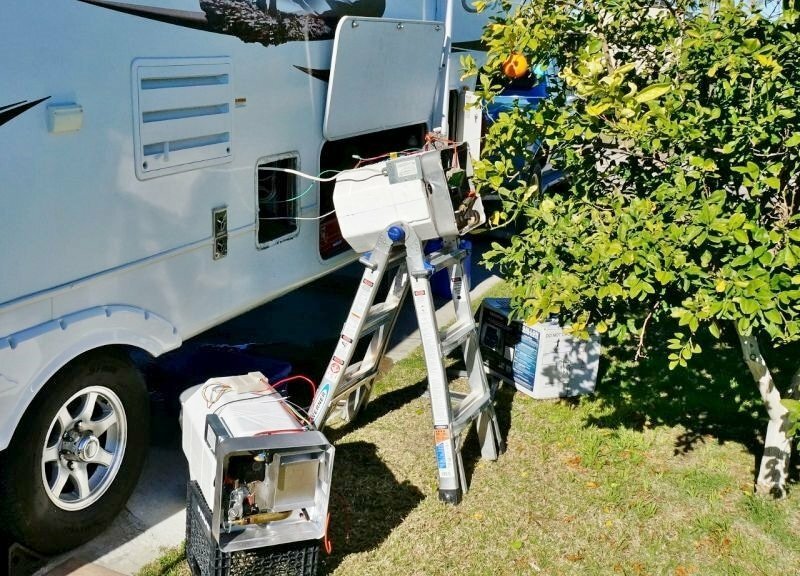 I decided the best course of action was to replace the whole RV water heater. 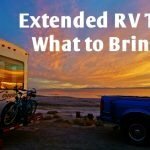 We packed up our off grid camp and headed to an RV Park where I could have a new water heater shipped. 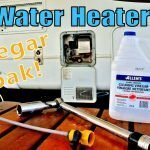 After a little online research, I found a new replacement Suburban SW6DE (5121A) RV water heater for just under $400 including shipping. It arrived the next day, and I went to work. 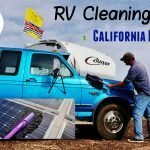 First: Disconnect shore power and the RV batteries. Turn off the LP gas supply. 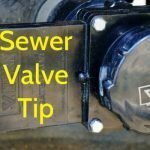 Disconnect the water supply and drain the water heater. 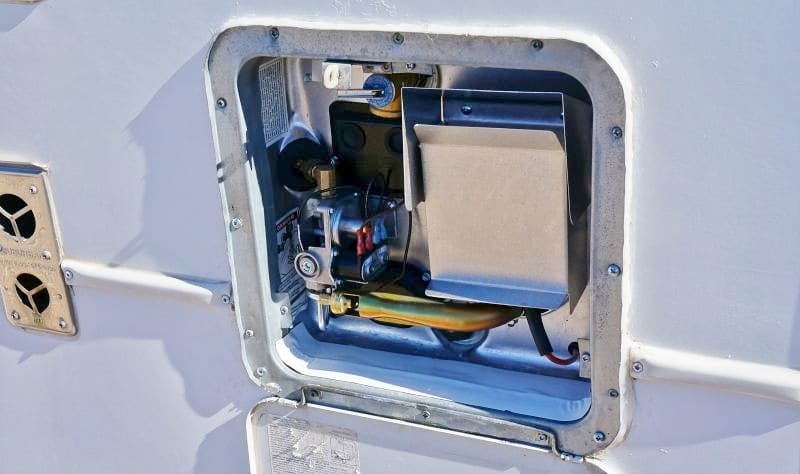 A thin metal frame is screwed and sealed to the RVs outside wall holding the water heater in place. After removing all the screws, I used an Exacto knife to cut through silicone caulking on the outside edge and a flat pry bar to work the metal frame loose from a layer of internal putty. The frame and the access door get reused. Once the frame is off the water heater, the next task was to undo the LP gas and water lines. The gas line runs through a rubber grommet and is attached with a flare nut connection. Care must be taken when loosening the nut so as not to damage the gas valve assembly. Use two wrenches. 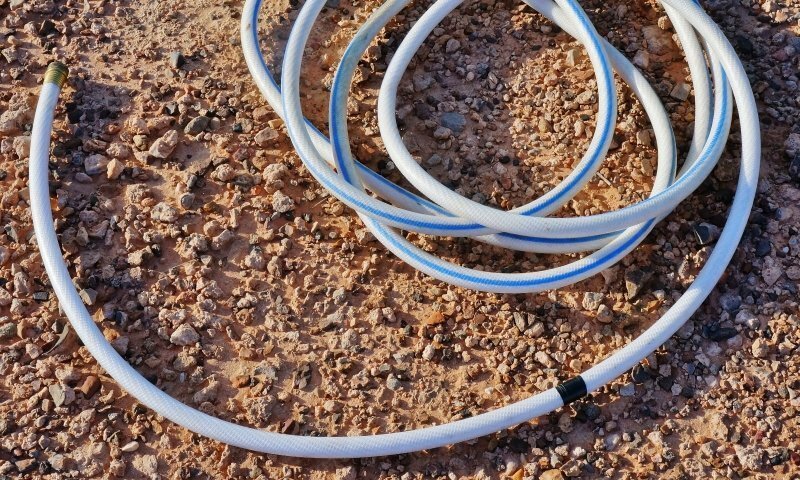 The hot and cold water lines at the back of the tank are only hand tightened plastic PEX connections so easily removed. Access in my Cougar fifth wheel was behind a panel beside the stairs to the bedroom. 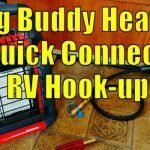 Once all that is done, the water heater could be slid out of the trailer wall. There was plenty of slack in the wiring to keep it attached. I used my Werner adjustable ladder to balance the old tank on. Being the water heater is a direct replacement made the wiring job super simple, the color coding was identical. The hot and neutral (black and white) AC wires attach inside a metal junction box with twist-on style wire nuts. The three DC wires for power, switch lamp and ground were connected with crimps. I elected to solder them instead. The water heater plastic control box has a peel-off adhesive pad for mounting to an internal wall. As with almost any project, something is bound to go wrong. For this one, it came in the form of a seized brass plumbing fixture. 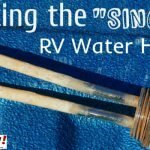 The RV PEX plumbing connects to the water heaters hot and cold lines using double male brass sleeves. The hot sleeve unscrewed easily, but the cold sleeve was seized solid. I ended up rounding off the nut trying to remove it. I was fortunate the hot sleeve came out easily because it contains a backflow valve where as the cold sleeve is an easy to find straight pass through style. With a quick trip to the hardware store, I was back in business. Once I had the wiring hooked up and the plumbing reattached next was the LP gas connection. While at the hardware store I picked up some leak detector and used it to make sure my LP gas connection was tightened up properly. Next, I turned on the water and let the tank fill checking for plumbing leaks. None found so good to go. I turned on the AC and DC power sources and in no time had hot water again! Then I fired up the LP gas and confirmed it’s operation. After letting it sit overnight and testing things out the next morning, I felt confident enough to reattach the external frame and seal it all up with a combination of butyl tape and silicone caulking. I did change one thing, though. Instead of silicone on the bottom inside seam, I used some Eternabond roofing tape. 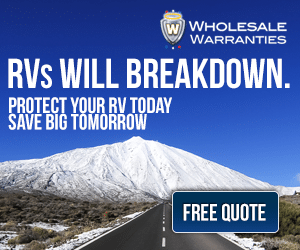 Why Did My RV Water Heater Fail? Curious to know “for sure” why the water developed a leak I hung onto the old one. I took off the styrofoam casing and drilled out an access hole in the side of the tank. Peering in with a flashlight in hand the fault became obvious. My early diagnosis of a faulty factory weld appears to be correct. I believe the welder created too much heat and perforated the tank wall. Eventually, the blob of welding material rusted and the pinhole leak developed. 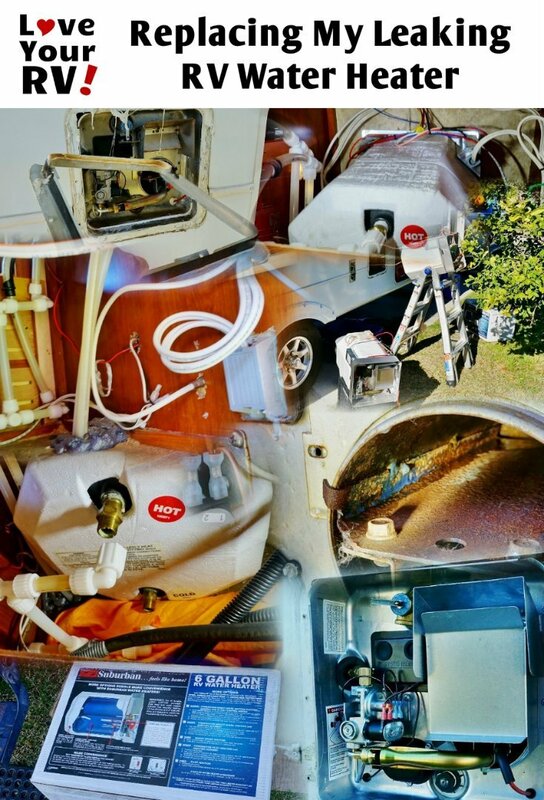 There were quite a few different tasks involved to swap out the water heater but broken down into each one nothing was overly complicated. I learned more about my rig, how they built it, saved some money and had a bit of fun at the same time.